Oven Roasted Potatoes – The perfect side dish to accompany most entrees. With a few simple ingredients and a baking sheet, you’re well on your way to crispy roasted potatoes. I hope all of you had a wonderful and blessed Thanksgiving. Now that Thanksgiving has come and gone it is now time to gear up for Christmas. Yes, Christmas, can you believe it? Oh my goodness, the year is almost over. Today, marks the official day of holiday shopping – hello Black Friday. But, before we get into that I wanted to take a few moments to share this easy recipe for Oven Roasted Potatoes. This is the perfect side to compliment that delicious left-over turkey in case you’re looking to change things up a bit tonight or any night of the week. They are also perfect with Butter Herb Roasted Turkey Recipe, Oven Roasted Butterflied Chicken, or Baked Beef Short Ribs. They’re crispy on the outside yet tender on the inside. Yukon gold potatoes are oval and slightly flat with a thin skin and yellow flesh. They have a slightly lower starch content than regular russet potatoes. Type of potatoes: When it comes to roasting potatoes, I like to use Yukon Gold Potatoes. Yukon gold potatoes are oval and slightly flat with a thin skin and yellow flesh. They have slightly lower starch content than regular russet potatoes. Unlike other potatoes, Yukon Gold has a creamy consistency and a buttery flavor which intensifies the taste and moist texture. Baking Sheet: I recommend you use the largest baking sheet that you have. Arrange the cut potatoes in a single layer without overcrowding the baking sheet. If needed, use 2 different baking sheets. The goal is to create a crispy outer layer. If the baking sheet is crowded with potatoes or the potatoes are overlapping, the potatoes will steam rather than roast. 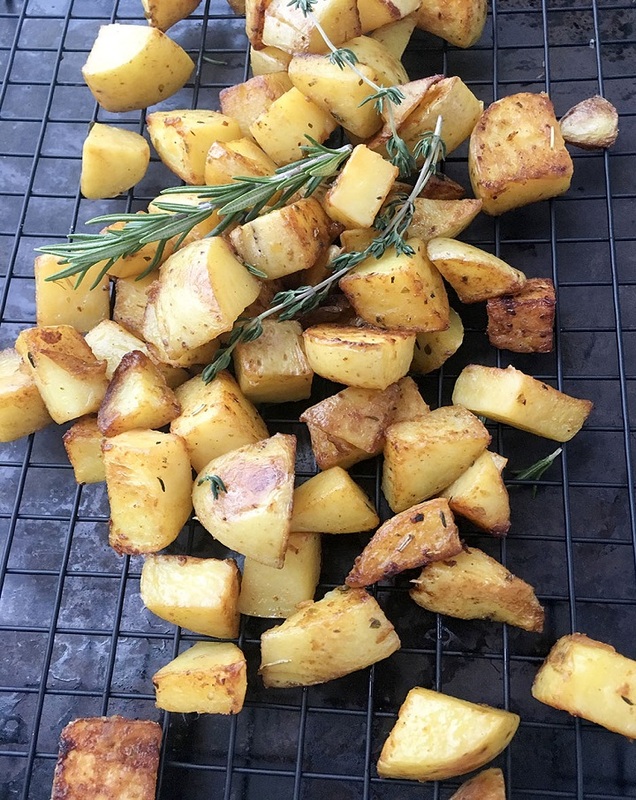 Seasoning: Although Yukon gold potatoes don’t require as much salt as russet potatoes, it’s still important to season with olive oil, salt and your choice of other seasoning and fresh herbs. 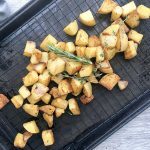 Fresh thyme and rosemary are perfect additions to Oven Roasted Potatoes if you have some on hand. At a minimum, I like to season with salt, pepper, smoked paprika, and Italian seasoning. Cooking process: Roast in the oven at a fairly high temperature to get a nice brown crispy outer layer. Once one side has browned, flip the potatoes over to get the same crispiness. Often time potatoes get a bad wrap when fried, or loaded with butter or sour cream. However, when cooked a certain way as in the case of Oven Roasted Potatoes, they offer far greater health benefits. If you follow a special gluten free diet or are gluten-intolerant, potatoes in general are naturally gluten free. Gluten is a type of protein found in wheat, barley, rye, spelt although wheat is the most common and is also known for helping foods maintain their shape. Keep in mind that although potatoes are naturally gluten free, not all dishes that call for potatoes are gluten free such as traditional potato salad as a example. These Oven Roasted Potatoes are perfectly crispy and golden brown on the outside and tender on the inside with a buttery creamy texture. Wash potatoes and dry with paper towels. Cut potatoes in half or in large cubes. In a small bowl, add seasonings of your choice. Set aside. Place cut potatoes in a single layer on baking sheet (DO NOT OVER-CROWD). Drizzle with olive oil and toss. Sprinkle seasoning mixture over potatoes and toss. Bake in oven until lightly browned and crispy. Turn potatoes over and bake other side until lightly browned and crispy.